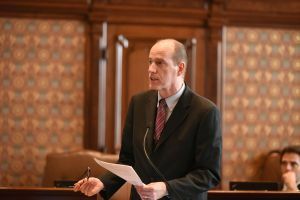 SPRINGFIELD— Senator Bill Cunningham passed legislation out of the Senate that would extend and expand the pilot program for the Accelerated Resolution Court or “Rocket Docket,” a program designed to quickly move minor offenses through the court system. House Bill 6190 would extend the sunset date of the pilot program to June 30, 2019. This would allow for the new offenses that would be added to be utilized under this program. The new offenses that would be added would include traffic violations and some minor drug offenses. SPRINGFIELD—Hair dressers and nail technicians throughout Illinois soon will be trained to properly detect signs of domestic violence or sexual assault thanks to legislation being pushed by Senator Bill Cunningham in the Illinois Senate. House Bill 4264 would require that cosmetologists, estheticians, nail technicians and hair braiders take a one-hour continuing education class about domestic violence and sexual assault awareness. The training will educate salon professionals about the signs of domestic violence or sexual assault as well as how to support and connect their clients with resources for help. The legislation was introduced in the House by Representative Fran Hurley. It is an initiative of the Chicago Says No More movement. The legislation has passed the Senate and returns to the House for a final vote before going to the governor’s desk. Senator Bill Cunningham spoke with Comcast Newsmakers' Ellee Pai Hong about his legislation to reform higher education administration pay and severance. 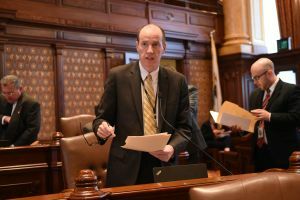 SPRINGFIELD—Senator Bill Cunningham joined colleagues in the Illinois Senate to pass legislation that would fully fund the MAP grant program for fiscal year 2016. House Bill 4167 would appropriate $227 million for MAP grants which would fund the program for the current fiscal year. This comes at a time when many universities and community colleges fronted the students. The legislation would allow the governor to ensure students who were promised MAP grants are allowed to keep them.